PAPADOPOULOS CREAM CRACKERS are light, tasty, rich in cereals and take care of our daily dietary balance. 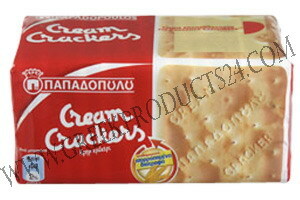 They are made with yeast which apart from its great flavor also offers vitamins and trace elements in a natural way. Their thin dough layers turns them into a light delight. They belong to the category of starchy foods and can be easily included in all daily snacks (mid-morning, afternoon and before bedtime) but also in all other meals, such as breakfast, lunch and dinner. It is noteworthy to point out that their content in fat is not high (13%), while this fat consists mostly of monounsaturated fatty acids, with a medium content of saturated fatty acids. They constitute a good source of compound carbohydrates (starch) with a low percentage of sugar (just 5%), so they can be easily introduced at the base of the diet pyramid with the other starchy food since they significantly contribute to the daily intake of complex carbohydrates. 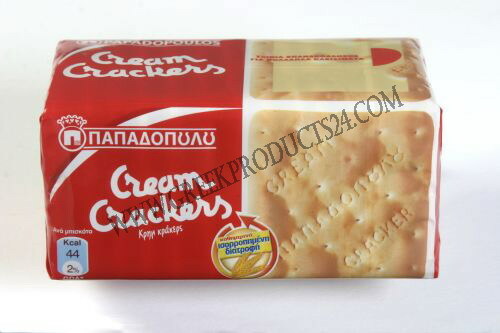 Significant amounts of vitamins (E, complex B) are found in PAPADOPOULOS CREAM CRACKERS, resulting from the product’s fermentation process.